FM or frequency modulation was originally developed for radio by Edwin Armstrong in the early 1900's. It was later used for sending television pictures in the 1940's. John Chowning was the first to exploit FM for music synthesis in the 1960's. 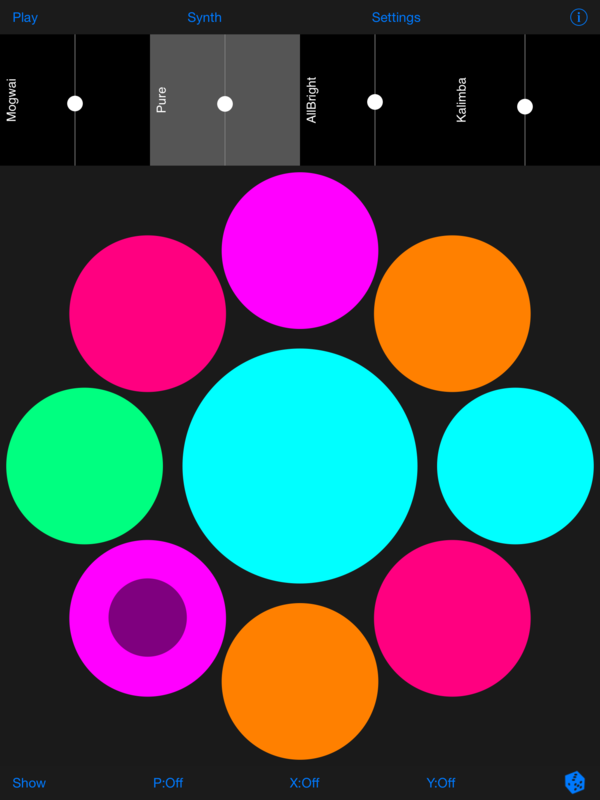 Given the limited processing power of early iOS devices FM seemed a good choice for generating complex musical sounds. Our first FM instrument Mandala Music was loosely inspired by the Hang, a drum invented by Felix Rohner and Sabina Schärer. A simple 2-oscillator FM synthesizer was used to generate pitched percussion-like sounds by tapping one or more keypads arround in a circular pattern. The pads are assigned notes from one of forty or so scales. Seven preset frequency ratios are provided: 1:3, 1:2, 2:3, 1:1, 4:3, 5:3, and 2:1 at four levels of modulation (modulation index): low, medium, high, and extreme. Some of the ratios are detuned slightly to give the timbre warmth. 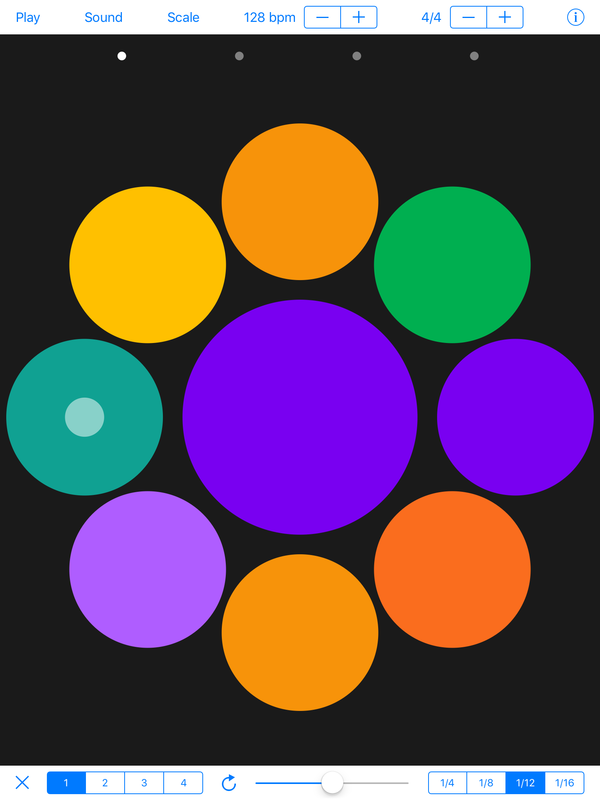 Mandala Music HD is an enhanced version of the app with some cool auto-looping features. Another "alternative" instrument app called Mantra Music uses the same 2-oscillator synth to play Indian ragas -- sequences of musical notes -- in different keys, tempo, and programmed patterns. Instead of the traditional attack-decay-sustain-release (ADSR) envelope generator our synths use a simpler attack-release control that can be inverted to allow reverse modulation effects. Orbulator is a multi-pad touch controlled synth that plays more like a real instrument than a conventional synth, allowing the user to articulate control sound parameters while playing. 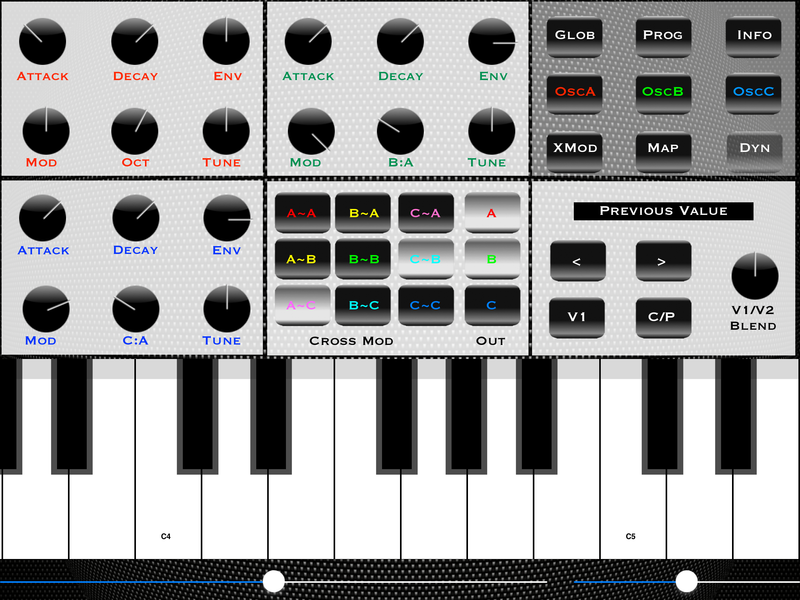 Synthia and SynSurface were our first traditional keyboard controlled FM synth apps. These apps were based on a second-generation three oscillator FM synth consisting of two modulators and a carrier. Ease of use was the design goal, which was achieved using a fixed arrangement of oscillators and a limited number of synth settings changed using push button controls. Our third-generation xMod app was originally inspired by the idea of feeding the output of an oscillator back to modulate itself. This turns out to be an extremely effective way of generating rich sounding sawtooth-like waveforms. (See Schottstaedt's article for an overview of FM synthesis techniques.) 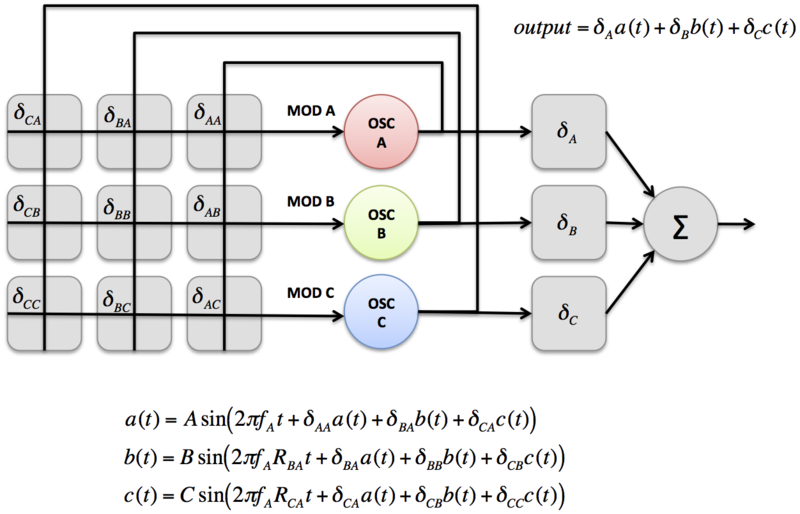 xMod's architecture consists of three oscillators connected by a 3x3 array of switches as shown in the figure. For example, turning on the diagonal switches (AA,BB,CC) produces three feedback FM oscillators running in parallel. Turning on switches AC and BC give two modulators and one carrier. Switches AC and AB give one modulator and two carriers. Switches AB and BC produce what is called cascade FM. Turn on CA and you have cascade FM with feedback. Turn on all the switches except for the diagonals and you have cascaded FM with forward and backward feedback. In all there are 2**9=512 different switch combinations. xMod and later third-generation apps contain 32 preset sounds that are displayed in 2-D sound space that allows the user to quickly move from one sound to the next by tapping or dragging your finger (the latter "smudges" sounds). xMod Lite is an easy to use reduced functionality version of xMod. Bach Machine is a version of xMod Lite that plays selections from a random playlist containing hundreds of Bach concerti, sonatas, inventions, and more. 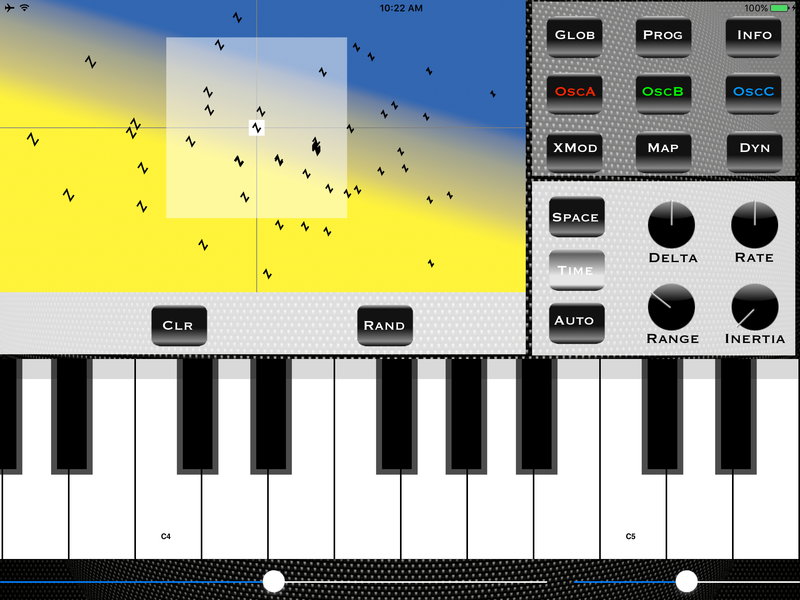 Bach Machine is an app version of the "Switched On Bach" style of the late 1960s. An "inertia" controls the transition (smudging) of sounds in space and time. Other features of xMod and Uber Synth include touch sensitive keyboard pitch bend and tremolo, full portamento, and an arpeggiator. All apps are Audiobus compatible. 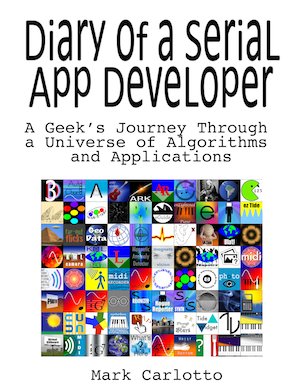 Documentation and video demos for most of our apps are available via the links at the top of this page.